One of the greatest needs we humans share in common is the need for encouragement because life has a way of throwing the 3D’s (Discouragement, Disappointment, and Disconnectedness) at us. A couple of nights ago on the news there was a story of two brothers running in a marathon and suddenly one of the brothers cramped up and couldn’t go any further because of dehydration. The other brother stopped, gave up his chance to win the marathon in order to help his brother to the finish line. Does that scenario have a familiar ring? Has someone put their life on hold for you? Have you put your life on hold for another? Are you now waiting for someone to offer you the encouragement you need to get back on track for the finish line? Is there someone you know stalled along the track that needs you to encourage and help them get going? Toward the end of the movie Forest Gump as Forest and his new wife come out of the church one of Forest’s friends shout, “You can do it…” If you’ve seen the movie then you know the scene is meant to be humorous but on the serious side those four words can completely change a person’s day or even their life! In case you think you don’t have what it takes to be an encourager I have some words of encouragement for you. Jesus does not call on your ability to be an encourager; instead He calls on your availability. When you make yourself available Jesus becomes available to you to encourage and empower you to be the encourager you need to be. 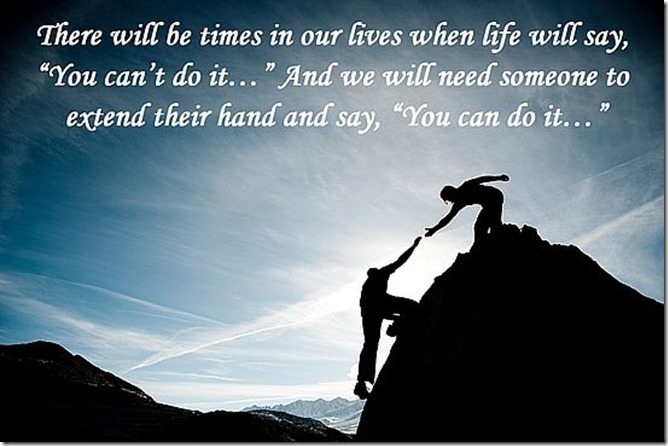 There will be times in our lives when life will say, “You can’t do it…” And we will need someone to extend their hand and say, “You can do it…” Will you be the one who will take another’s plight to heart and not remind them of what they cannot do instead tell them, “You can do it…” And if they can’t do it on their own help them?